Sergé Bogaerts (2013): Chalcides mauritanicus (Duméril & Bibron, 1839). En: Martínez, G., León, R., Jiménez-Robles, O., González De la Vega, J. P., Gabari, V., Rebollo, B., Sánchez-Tójar, A., Fernández-Cardenete, J. R., Gállego, J. (Eds.). Moroccoherps. Anfibios y Reptiles de Marruecos y Sahara Occidental. Disponible en www.moroccoherps.com/ficha/Chalcides_mauritanicus/. Versión 16/05/2013. Consulta realizada el 25 de abril de 2019. Français: Seps à deux doigts, Seps de Maurétanie, Hétéromèle. Área de distribución mundial de Chalcides mauritanicus según la IUCN. Lo sentimos, la siguiente información no está disponible en castellano actualmente. Synonym (Uetz & Hošek, eds.). Heteromeles was established as a new genus for this species by Duméril & Bibron (1839) because of the absence of several fingers and toes. However, they already write that it's morphology resembles that of Seps chalcide (now Chalcides chalcides). The first specimen was delivered by them by luitenant-colonel Levaillant and came from Algeria. No exact locality is given but according to Pasteur & Bons (1960) it should be Oran as said in Boulenger (1891). Boulenger (1891) mentions three specimen: two in the museum of Paris which he examined and a third in the collection of M. Lataste. He includes it in the genus Chalcides. Later Pasteur & Bons (1960) rehabilitated Heteromeles as a subgenus. Pasteur (1981) again places it in Chalcides. Carranza et al (2008) based C. mauritanicus as basal in the clade of grass-swimming Chalcides (including Chalcides chalcides, Chalcides minutus and Chalcides guentheri; but not Chalcides mionecton) from where it seperated the rest of this group 9.9 million years ago. It is an elongated but small sized skink. Caputo et al. (1995) give measurements for 10 adult specimen where mean snout vent lenght is 65.9 mm (ranging from 54.7 - 71.8). Tail in unbroken state of similar size (see photo's and photo in Sindaco & Jeremenko, 2008). Limbs are strongly reduced. Boulenger (1891) writes: "Snout conical, slightly projecting; earopening minute, -arcely distinguishable; nostril entirely in advance of the suture between the rostral and the first labial; fourth upper labial entering the orbit; supranasals distinct. Body much elongate. 18 scales round the bocly. Limbs very short; the anterior didactyl, the posteri tridactyle; thircl.toe nearly twice as long as second; the hind limb equals the length of the head, and the fore limb the distance between the end of the snout and the posterior border of the eye. Yellowish or greyish above, with a latelal band formed of closely-set large black dots". Chalcides mauritanicus. Saidia. Photo: © Sergé Bogaerts. Caputo et al (1995) conclude that C. mauritanicus has an even longer and narrower body than C. mionecton and has a completely obliterated ear opening, which fits to it's fossorial living. Two colour variations of Chalcides mauritanicus. Photo: © Sergé Bogaerts. Resembles in size and coloration strongly Ophiomorus sp. from the Near - and Middle East (see picture of O. punctatissimus). 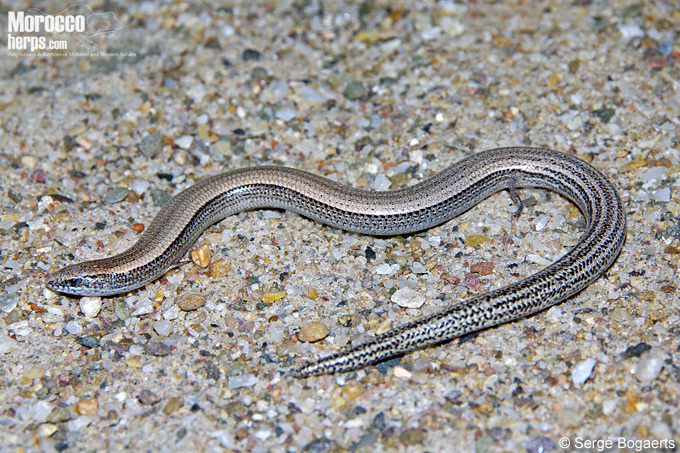 Or to juvenile Anguis fragilis as Mellado et al. 1987 write. Dorsal side is yellowish to silvergrey with no ocelli. Often is a dark stripe visible along the middorsal. Lateral sides darker and ventral side grey. Tail lighter, grey-white coloured with dark stripes. In juveniles the tail is bright red until they are 7-8 months old (Doumergue, 1901). Ophiomorus punctatissimus (Patara, Turkey). Photo: © Sergé Bogaerts. This species has had little attention through the years and even now, virtually nothing is known about it's ecology, life history, population densities etc. In fact it is still not known for certain if the species is live bearing! We found this species only in the dune based area between Ras el Ma and Saidia and only by turning over rubbish like old clothes, cardboard, plastic etc. We never saw one active out of it's hidding place, but our observations were done only in Spring (april 2009 and 2013). Mateo et al (1995) also mention finding them by turning over dead wood, cardboard boxes and stones very nearby the sea. It is presumed that the females give birth to fully formed young (Mateo et al., 2009). Juveniles are found end of July beginning of August, and measure 36 + 24 mm (Doumergue, 1901). Firstly this skink was only known from the littorial / coastal area of northwestern Algeria (Doumergue, 1901). Werner (1929) writes to have obtained a specimen from Kreider, which has never been reconfirmed as it is far south from the coast. It was not known from Morocco until recently. Even in 1981 Pasteur only knew it from the coastal districts of Oran and Algiers provinces of Algeria, although Pasteur & Bons (1960) claim it's presence as highly probable in the northeast in their overview of reptiles of Morocco. Mateo (1991) mentions it first for Melilla, but gives no further data and already considers it extinct there (Mateo et al., 2009). 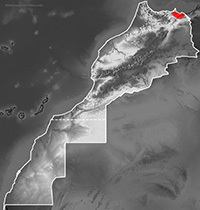 In Mateo et al (1995) four localities are mentioned: one for Algeria, about 25 km from the Moroccan border (between Algiers and Ghazouat: Doumergue, 1901) three for Morocco: Ras el Ma, Mellila and Beni Enzar. It appears to have a restricted range. It is mainly a coastal, lowland species that is known up to at least 140 m asl (Sindaco, October 2008 in Mateo et al., 2009). 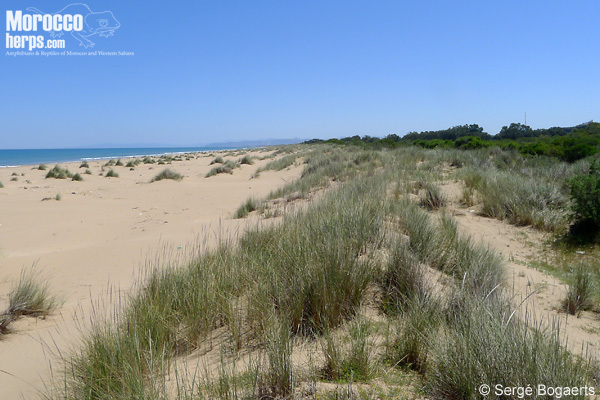 Habitat in the dunes west of Saidia. Photo: © Sergé Bogaerts. Doumergue (1901) describes finding it under stones in the sandy area’s along the coast of Oran. Mellado et al. (1987) describe the habitat 2 km east of Ras el Ma in the coastal zone behind the dunes where exotic trees are planted like Eucalyptus along Acacia, Retama. This skink lives in sandy (dune) soils where it dives into as quickly as Scincus sp. Doumergue (1901) describes it is extremely difficult to catch often leaving you with only the fragile tail in your hands. 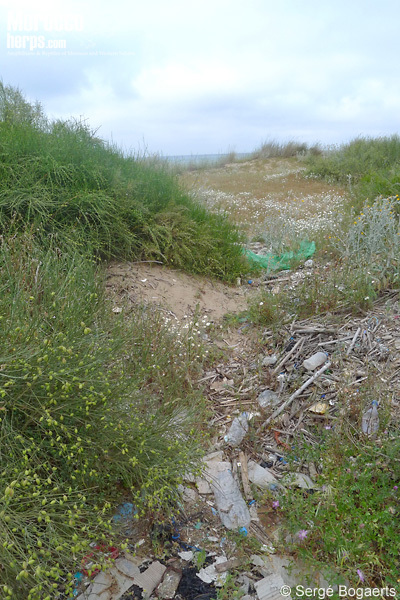 Habitat in the dunes east of Ras el Ma. Photo: © Sergé Bogaerts. This species is considered Endagered by IUCN because its Extent of Occurrence is less than 5,000 km2, its distribution is severely fragmented, and there is continuing decline in the extent and quality of its coastal habitat. It is not known to exist in severely degraded habitats (Mateo et al., 2009). Bons & Geniez (1996) suspect it to live also in sandy area's west of Melilla, so far it has not been found there. Further surveys are needed to better determine the range of this species. It is known to exist in the following protected areas: Embouchure Moulouya and Sebkha Bou Areg (Mateo et al., 2009). 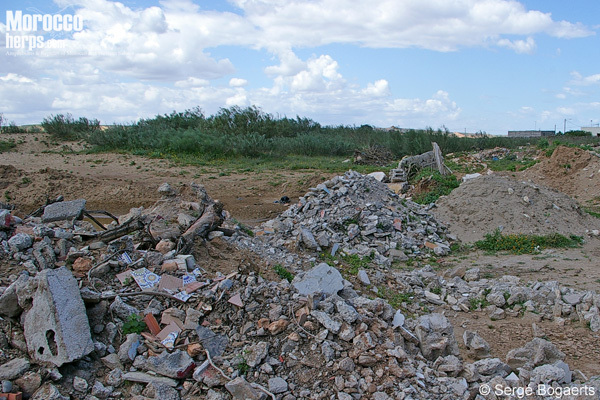 Habitat destruction in progress in Saidia. Besides C. mauritanicus, we found here also Discoglossus pictus, Chalcides parallelus, Tarentola mauretanica, Trogonophis wiegmanni, Acanthodactylus boskianus, Testudo graeca, Macropotodon abubakeri. Development of coastal areas for tourism and holiday villages are at the moment the biggest threat to this species as the complete dune system is broken down. It is possibly also threatened by loss of ground cover habitat, such as the collection of driftwood by local people for firewood (Mateo et al., 2009), however, it is replaced by a lot of rubbish and waste which seems to be used as well by this skink. All current habitats are degradated. A lot of habitat has already disappeared by the extensive buildings west of Saidia in the direction of the Moulouya rivier. Boulenger, G.A. 1891. Catalogue of the reptiles and batrachians of Barbary (Morocco, Algeria, Tunesia) based chiefly upon notes and collections made in 1880-1884 by M. Fernand Latatse. – Transact. Zool. Soc. London, 13 : 93-164, London. Caputo, V. Lanza, B. & Palmieri, 1995. Body elongation and limb reduction in the genus Chalcides Laurenti 1768 (Squamata Scincidae): a comparative study. Tropical Zoology 8: 95-152. Doumergue, F. 1901. Essai sur la faune erpétologique de lÓranie. Imp. Typogr. Fouque : Oran 404 p.
Duméril, A.M.C. & Bibron, G. 1839. Erpétologique generale ou histoire naturelle complète des reptiles. Tome Cinquième. Paris. Mateo, J.A., 1991. Los Anfibios y Reptiles de Ceuta, Melilla, Chafarinas, Peñon de Vélez de la Gomera Peñon de Alhucemas e isletas. Revista Española de Herpetologia 5: 37-41. Mateo, J.A. Joger, U. Pleguezuelos, J. Slimani, T. Hassan El Mouden, E. Geniez, Ph. Martínez-Solano, I. 2009. Chalcides mauritanicus. In: IUCN 2012. IUCN Red List of Threatened Species. Version 2012.2. . Downloaded on 10 May 2013. Mellado, J. Caputo, V. Nascetti, G. 1987. Sobre las poblaciones de Chalcides del Nordeste de Marruecos. Revista Española de Herpetologia 2; 183-186. Pasteur, G. 1981. A survey of the Species Groups of the Old World Scincid Genus Chalcides. Jounral of Herpetology 15: 1-16. Pasteur, G. & Bons, J. 1960. Catalogue des Reptiles actuels du Maroc: révision de formes d'Áfrique, d'Éurope et d'Ásia. Trav. Inst. Scient. Chérifien, zool. ser. 21: 1-132. Sindaco, R. & Jeremenko, V.K. 2008. The Reptiles of the Western Palearctic. 1. Annotated Checklist and Distributional atlas of the turtles, crocodiles, amphisbaenians and lizards of Europe, North Africa, Middle East and Central Asia. Edizioni Belvedere, Latina (Italy). Uetz, P. & Jirí Hošek (eds. ), Chalcides mauritanicus (DUMÉRIL & BIBRON, 1839). The Reptile Database, http://www.reptile-database.org. Accessed on 15-5-2013). Werner, F. 1929. Wissenschaftliche Ergebnisse einer zoologischen Forschungsreise nach Westalgerien und Marokko. Sitzungsber. Akad. Wiss. Wien, mathem. - naturw. Kl. abt I, 138: 1-3.